In this post, I am going to talk about some pink guppies that I manage to get hold of from a local fish shop in Singapore. They have been appearing in the fish shops on a consistent basis and I think the breeder is a Guppy farmer here in Singapore. 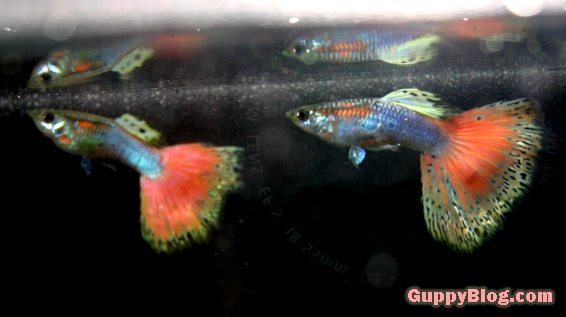 In my opinio, the above guppies are a cross between Japanese Blue Guppies and the the Red Grass strain. I might be wrong but if I have my reasons to actually state the above. One is the observation that if you look closely at the Caudal fins of the pink guppy, you will see scattered black spots that are very characteristic of the Grass strains and reminiscence of the Red Grass guppy strain. Another possible cross is a strain which I would just refer to as the Red Delta strain that is a common sight here in Singapore and is bred in big numbers here in Singapore Guppy farms. The above is just some speculation and observation. I might be wrong, really wrong and I would really appreciate it if anyone who has had some experiences with these guppies help to enlighten us a bit on the genetic makeup of this fish and how it was developed. Something seems wrong here. The caption for yellow snakeskins seems to show pink guppies. Hi James, thanks for visiting. The web can be a really queer place sometimes. Beautiful guppies. I got guppies for my wall aquarium. Its 10 gallons and it has worked out great! I got 12 guppies! I am thinking of getting a few females 1-2… Will the males eat all the fry? I am thinking of getting another 10 gallon aquarium and putting 1 female and 3 males into it. BayshoreAquarium.com has a great sale and I can’t pass up the opportunity to get more. Hi there, nice blog you have here! 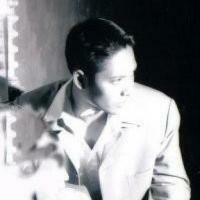 Thanks for dropping by my guppy blog. If you are in Singapore, check out Pasir Ris Farmway. They have quite a good range of guppies there. I’ve seen a related albino strain in local fish shops here. The red on the tail is not as marked though. I was thinking of crossing it with my Moscow Blue to see what it would give me. It would be interesting if you crossed out the fish. 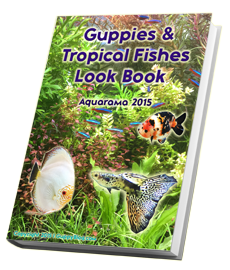 Just know that the strains involved in creating those pink guppies are most likely Red Grass and Japan Blue. The blue body in Japan Blue lines are quite dominant. So, by crossing with the Moscow blues, you might get an interesting outcome. I was thinking of using the Y linked Moscow against the X linked grass features. I understand the Japan Blue colouring is Y linked too. So I was thinking by using the female, I could safely avoid the Japan blue from passing on to the next generation. Here is a video in which the male of the mentioned strain appears.